Crabgrass has been emerging for several weeks now, depending on the exposure. Warmer and more open turfs will likely have more advanced (larger) plants while cooler and denser turfs will have smaller plants. Management options for this weed at this point in the season range from doing nothing to postemergence herbicide applications. from a footpath on June 11th. Small populations of crabgrass may be tolerable in utility turfs as long as the population is small and not showing signs of overtaking perennial species that are covering the soil. Crabgrass is an annual species that dies with frost in early autumn but can multiply (spread) rapidly with each successive year through annual seed propagation (even under routine mowing). Extensive crabgrass populations can form a dense vegetative cover of the soil during summer; however, that cover is rapidly lost during fall and winter. Thus, soil erosion during winter and spring is a significant environmental quality risk that must be considered in a management plan where crabgrass has or threatens to become a major component of the vegetative cover of a landscape. Keep in mind that mowing as high as feasible, avoiding frequent irrigation, maintaining good soil quality/health, and annual overseeding of areas of thinning turf will be helpful in suppressing infestation of crabgrass and other weeds. However, it is important to realize that these practices will not provide adequate suppression in all years or situations. This option works but it is only practical where the labor (time) available to manually remove plants is matched with the size of the landscape that needs weed control. It is relatively easy for a person to manually remove plants from small planting beds and very small lawns (urban/city lots). Manual removal becomes an overwhelming job when the landscape size becomes too large (suburban and commercial lots). In most situations it is now too late to apply preemergence herbicides to control crabgrass, too much of the crabgrass seed that will germinate this year has already. Moreover, use of a preemergence herbicide this late in the growing season will essentially eliminate the ability to overseed the remainder of this season. So most people interested in chemical options must now focus their attention on postemergence herbicides. There are several “organic” herbicides that can be used for postemergence control of small seedling crabgrass plants but users must also realize that these products are non-selective. Non-selective organic herbicides act on all plants by disrupting the integrity of plant cells and essentially “burning off” the foliage contacted by the spray solution. Most of these products do not translocate (move) to other parts of the plant, so the roots and other portions of the plants not contacted by these organic herbicides do not die. Those organic herbicide that are advertised to translocate, do not translocate very well. Thus, to be effective, organic herbicides must used when the crabgrass plants are very small seedlings (one to three leaves). And because these organic herbicides are non-selective, users need to be aware that any non-target desirable plants contacted by the spray solution will be “burned” as well. Large, mature desirable plants are not likely to die if contacted by an organic herbicide but there will be cosmetic injury. Spot spraying with non-selective organic herbicides is generally a better approach than broadcast spraying. However, there are some that do apply organic herbicides in broadcast sprays; these users are willing to accept injury to the desirable plants. 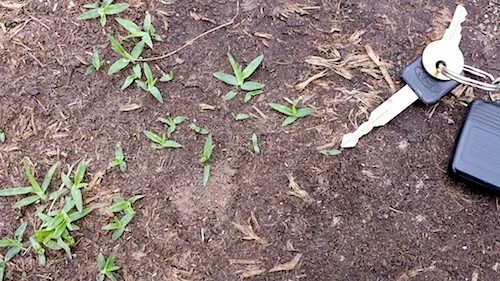 There are also conventional postemergence herbicides that can be used to control seedling crabgrass. Dr. Stephen Hart’s fact sheet on Crabgrass and Goosegrass Control in Cool Season Turfgrass provides an overview on the use of dithiopyr (Dimension®), fenoxaprop (Acclaim®), and quinclorac (Drive®) for postemergence control of crabgrass. A couple of newer herbicides that can also be used for postemergence control of crabgrass include mesotrione (Tenacity®) and topramezone (Pylex™). Be aware that each of these materials have specific recommendations for rates and timing of use, which are largely predicated on the size of the crabgrass plants ( e.g., 1 leaf, 2 leaves, 4 tillers, etc.) needing to be controlled. Safety on turfgrass species also varies with these products. Be sure to consult the label for specific rates and timings based on the desired turf species and other restrictions for use.